Are you or your employers constantly slipping in your work area due to splashes or over sprays from water or other liquids? 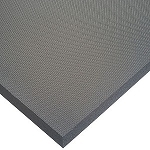 There is no need to worry now that you will be using the T17 Superfoam Floor Mat which will prevent slipping and tripping accidents. 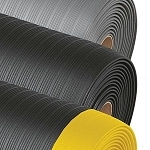 The T17 Superfoam Floor Mat is manufactured from a closed cell PVC Nitrile foam blend that makes it lightweight for easy handling and resistant to oils, greases, animal and vegetable fats. 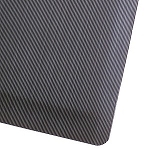 This weightless floor padding comes with all four sides beveled to prevent tripping hazards and can easily be removed for cleaning with a mild degreaser and hose or even throwing in the dishwasher is safe. 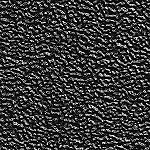 A perforated version of this floor covering is also available with drainage holes to easily remove excess liquids from work areas. We highly recommended using this floor pad in dishwashing stations and bars.